The Phalaenopsis reigns as queen of the houseplants. Also known as the Moth Orchid, this marvellous style icon produces butterfly-like flowers that provide pleasure for months on end. The Dracaena has become a houseplant classic. This is a plant that definitely makes a statement with its exotic appearance and cool leaf patterns – and it lets you breathe in the greenness. 5 Stars – and it shows! The Piet Vijverberg Nursery, producer of this Phalaenopsis and Dracaena, devised ‘Star Quality…By5’ as the brand name for these products to emphasis their excellence. 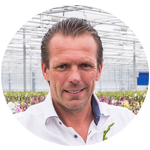 Although the name also alludes to the producer’s family name, which is VIJVerberg (VIJF meaning ‘five’ in Dutch), it was chosen mainly in reference to the 5-star quality of the nursery’s products. This orchid, with its delicate pastels, excitingly bold colours, and unique markings, is a surprisingly low-maintenance plant. To find out the best way to care for your Phalaenopsis, read our tips! This foliage plant is guaranteed to add a note of elegance to your home for a long period of time. It's a low-maintenance plant that requires very little care. All the information about what makes your Dracaena happy is available in our care tips. 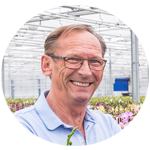 The Piet Vijverberg Nursery is aware of the needs of both people and the environment. Innovation and progressive cultivation technologies, as well as our years of growing experience and good old-fashioned green fingers, ensure that we produce plants of excellent quality. Production at the Piet Vijverberg Nursery is based on the specifications of our MPS-A certificate; this is the leading certificate when it comes to sustainability and ensures that we use the most environmentally responsible growing methods.